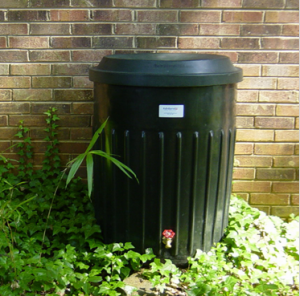 Are you looking for rain barrels in Wilmington? We have two great rain barrels to choose from! Short Stack and Tall Stack are available for purchase and pick up on the 2nd Thursday of each month between 9:00am and 4:30pm. A newly created, custom molded rain barrel specifically designed for use as a rain barrel. Unlike used barrels, our openings for the spigot and overflow ports are metal fittings molded into the rain barrel. The RainBarrelUSA has Solid HDPE construction, Brass spigot, two overflow ports with male garden hose thread. Uses standard garden hose for water distribution, Requires no special hoses or piping, the two overflow ports permit extended length hoses to move water away from the house foundation, the Brass spigot works well with a soaker hose. Perforated Plastic entry cover permits rain entry, Easy debris removal, Standard solid Brass fittings can be replaced if damaged, Replaceable entry screen cover prohibits insects. Removable lid for easy barrel cleaning, Top can be secured for safety, Accommodates any size downspout, Concave top channels rain to center, Low mounted spigot offers more usable water from barrel, Ribbed sides for extra strength. Dark color prevents algae growth, Minimum assembly, Dark green color blends with shrubbery. Gravity fed. No pumps required. Where should I set up my rain barrel? Choose a downspout on your house or garage that is closest to the plants you water the most. Remember that rain barrels are gravity-fed systems, so be sure you install them so the water can run down hill. Do I need to put my rain barrel on blocks? 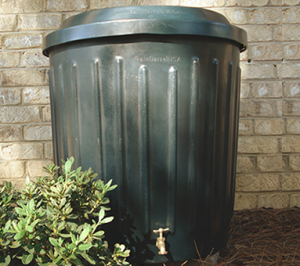 Your rain barrel must be placed on a solid, level surface. Water weighs over 8 pounds per gallon. A full 60 gallon barrel will weigh 500 pounds, and a full 80 gallon barrel will weigh close to 700 pounds. We suggest you raise the barrel with landscape blocks, as this will help with the gravity-fed flow. Does my Homeowner’s Association (HOA) allow rain barrels? How do I maintain my rain barrel? Rain barrels require very little maintenance. Keep the lid on tight and the screen free of leaves and other debris. If water is left in the barrel for too long, it may develop an unpleasant smell. If this happens, we recommend completely draining the barrel and cleaning the inside with a brush and fresh water. To clean the screen, simply unscrew the two small screws holding the screen in place, and carefully lift out the screen to clean it. Place screen back into the opening and tighten the screws back into place. How do I keep mosquitoes and other insects out? The barrel is equipped with a mosquito-proof screen that is screwed down into the center of the lid. This screen prevents mosquitoes and other bugs from entering the barrel. What if I do not use of the rainwater in the barrel? Most barrels will fill quickly in even a brief rain. If you’re not using all of your water, you may consider attaching a soaker hose that will allow for drip irrigation. This will allow water to slowly trickle out of the barrel and water your plants. How does the overflow valve work? Rainbarrel USA barrels are designed with two overflow valves, located toward the rear on each side. We suggest connecting garden hoses to the valves to help divert overflow rain away from your home’s foundation. The rainwater can be diverted to a nearby garden or shrubbery area. Contact our partner, RainBarrel USA. They’re happy to help!